I was going to title this blog another "Just Another Manic Monday" but the events that have occurred since have made me change that. We'll get to those interesting events in a moment. On Saturday, we had lunch with my mom's friend Jay and her daughter Lynn. We even had cupcakes for dessert and Lynn took me to visit her brother's beagles. After my nap (yes that is some unusually crazy hair) we went to my great uncle's restaurant for dinner. I got to see my second cousin Plurn who is just a couple weeks older than me. I threw the picture of chestnuts in there for Mr. Triche. On Sunday I woke up ready to hit the pool with Yai Pom. I even grabbed my boat for the trip. Monday, January 9th was a doozy. We were on our way first thing in the morning to the doctor so BobBob and Ta could get an annual checkup (doctors here are good and cheap) when out of nowhere during rush hour traffic we got side swiped by a bus. I know it sounds serious, but we were going 5 miles an hour and he must not have seen us and tried to take over our lane. We heard a crunch, stopped, and haggled with the police over whose fault it was. Good thing for my trusty camera. Turns out it was the other guy's fault. They towed our car to the station, the insurance guy met us there, and all the paperwork done while we waited. Definitely One Stop Service. After spending the morning at the station, I was at Yai Pom's house when I started feeling pretty warm. Before heading back to the condo we hit up the doctor just to be safe. I had a temperature of about 101. They put me on antibiotics and gave me some cough meds too since I hadn't slept well the night before. Notice the No Pictures sign in the background. Oops. I had a fitful night of sleep and had a followup visit the next afternoon. When they checked me, my temperature was still high so doctor thought it best to admit me for the night to get me better since I am traveling back home in a week. They did a warm water bath to get my temp down quick, took a chest x-ray, drew blood, and then gave me an IV since I hadn't really wanted to eat or drink much since lunch on Monday. I was a trooper during the whole thing, but definitely she a few tears while having blood drawn. BobBob and Ta brought me back necessities for my night stay...monkey, binky, books, and of course movies to watch (thanks Avery, your DVD player has been mom's savior). Anyway, I'm doing well so please don't be concerned. Doctor said I have a touch of pneumonia in my lungs but that I could go home after being fever free for 24 hours and I should be feeling back to my usual chipper self within 3 days. Just keep me in your thoughts for a speedy recovery so I can enjoy the rest of my vacation before I head home and back to school. Oh, and in case you were worried about the doggies, they are all doing well. 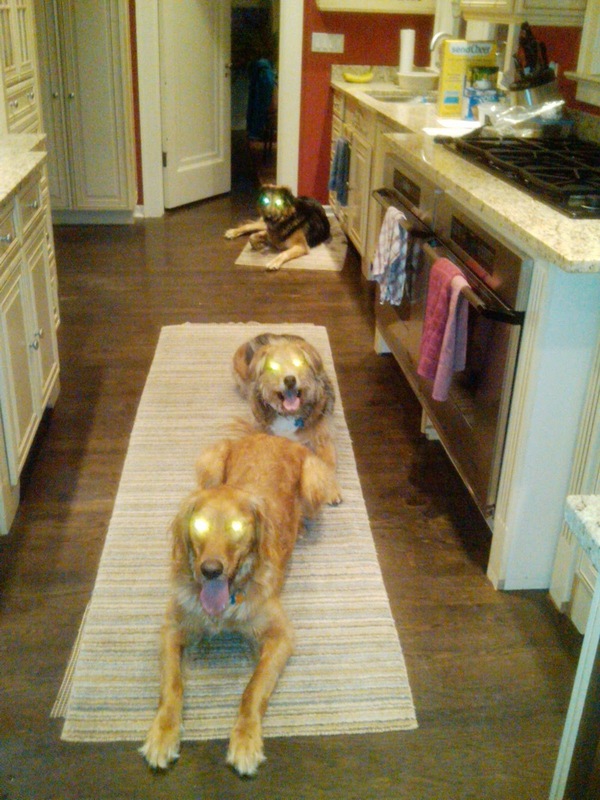 Here's a pic Brad snapped of them waiting for dinner time. They're getting lots of excercise and plenty of food! You are not helping me convince my dad of EVER letting me go overseas. Sick, hospital, car acccident. Yikes! Hope for a safe & healthy trip back!